Kim Dotcom Sings: Are You Going to Fix This Mr. President? Kim Dotcom has just released his long-awaited new song 'Mr. President', directed at United States President Barack Obama. In the song Megaupload's founder says that Hollywood is taking over politics and that the Government is killing innovation. Dotcom released the song and video on his newly launched website, and both can be shared for free. These are the opening words of Kim Dotcom’s newly released track ‘Mr. President’. The song is directed at U.S. President Barack Obama who, according to Dotcom, played an important role in the destruction of Megaupload. Despite being involved in what the Department of Justice describes as “the largest criminal copyright cases ever brought by the United States,” Kim Dotcom has not chosen to lay low. Instead, he is fighting the forces behind the criminal investigation both off- and online. “Our Internet Freedom is under attack on President Obama’s watch,” Dotcom told TorrentFreak this morning commenting on the release of the song. “President Obama should have a look at the situation and reassure his voters that Internet freedom and innovation are his priorities. He should consider helping millions of Mega users to get their files back. Obama should motivate Hollywood to innovate and adopt to today’s light speed Internet environment instead of freezing innovation and progress,” Dotcom adds. Megaupload’s founder previously told TorrentFreak that Vice President Joe Biden was the one who ordered the shutdown of the file-hosting service. According to Dotcom the Mega investigation was a ‘gift’ to Hollywood, facilitated by corrupt Government forces. By targeting Megaupload and teaming up with Hollywood, the U.S. Government chose a path of destruction that will kill many new and innovative businesses on the Internet, Dotcom believes. This needs to change. “There needs to be a dialog leading to solutions. Aggression and destruction will hurt the US economy. The innovators of tomorrow will avoid doing business in the US. Shutting down one of the leading cloud storage sites, ignoring due process, the rule of law and the constitutional rights of our users is not the way to go,” Dotcom told us. 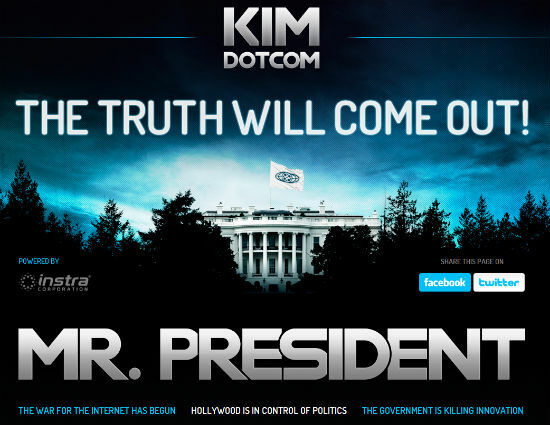 The track and video are now available on Kim Dotcom’s newly launched website Kim.com. c There are 172 comments. Add yours?